ABC To Broadcast NYC Pride March 2017 - Joe.My.God. NYC Pride announced that WABC-TV will be its official television partner and broadcast the 48th NYC LGBT Pride March on Sunday, June 25, 2017. The NYC Pride March started in 1970 as a civil rights demonstration on the 1-year anniversary of the Stonewall Uprising. Today, it is one of the world’s best known LGBT events, with 350 marching contingents and more than 2 million spectators in 2016. WABC-TV will broadcast the annual trek down Fifth Avenue from Noon – 3 p.m. on Channel 7 and also stream the event on its website, abc7ny.com. This important new partnership comes at a time of political and social turmoil in many communities. “We’re excited to have Tri-state viewers welcome us into their homes for what will be an unprecedented opportunity for the LGBT community’s collective voices to be heard,” said Chris Frederick, NYC Pride Managing Director. 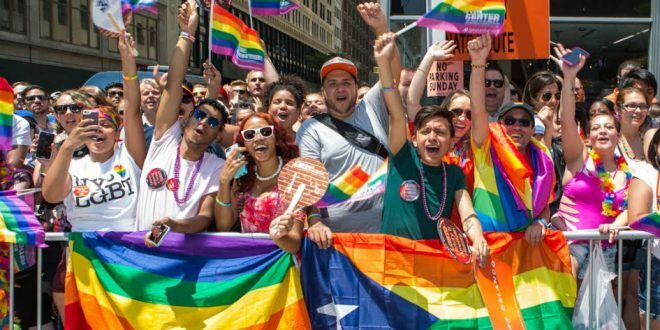 In addition to the live broadcast, the station will also provide coverage of other essential NYC Pride events: PrideFest – the annual LGBT street festival, Pride Luminaries Brunch, the Rally, and Pride Island – a new three-day LGBT cultural experience. This year’s theme, “We Are Proud,” speaks to the LGBT community’s unwavering ability to rise and be proud, even in the face of the existing political environment. The American Civil Liberties Union, Brooke Guinan (trans woman, FDNY firefighter), Krishna Stone (Director of Community Relations, GMHC), and Geng Le (Founder, Blued) will helm 2017’s iconic March.